When it comes to the relationship you want, are you telling yourself you can't have it? Do you believe it's possible? Do you believe it could happen easily to you? Do you believe that you deserve it? Apply this to attracting your soulmate + creating a better relationship with your current partner. Journal a list of all of your limiting beliefs about your relationship, love, attracting love, finding your soulmate and whatever feels most needed to you. Want a healthy, happy, fun, passionate, real, authentic, loving relationship? Do this. 2. HOW DO YOU HANDLE COMPROMISE/SACRIFICING YOUR TIME FOR YOUR PARTNER? 3. HOW DO YOU COMMUNICATE WHAT YOU REALLY NEED? 5. HOW DO YOU KEEP THE RELATIONSHIP FRESH? 6. DO YOU MAKE A POINT TO HAVE ALONE TIME OR TIME AWAY FROM EACH OTHER? DO YOU HAVE SEPARATE SOCIAL LIVES? 7. DO YOU HAVE DAILY HABITS THAT KEEP YOU IN SYNC? WHEN YOU FALL OUT OF SYNC HOW DO YOU GET BACK? 8. HOW DO YOU COMMUNICATE WHEN YOU GET INTO A DISAGREEMENT OR ARE FRUSTRATED WITH THE OTHER PERSON? Plus, how to diffuse a serious disagreement. 9. WHAT'S SOMETHING YOU DO TO KEEP THE RELATIONSHIP OPEN AND FLUID? 10. WHAT DO YOU DO TO INSPIRE EACH OTHER? "Josh and Steph, not only have you shown me how to lose weight, live healthier and feel better; but you two have prepared my heart for love and without much effort I've found the love of my life. I can't begin to describe how grateful I am for the two of you and your inspiring love." "You've given me the greatest gift in the world. You've brought the love and the fire back in my relationship. My husband and I are happier than we've ever been and now get to connect in love over healthy meals that we cook together and workouts that we do as a couple. We're in the best shape we've ever been as a couple and are more in love than ever." I am a certified health coach and personal trainer, leader in love, mindset & emotional breakthrough expert as well as a nationally recognized model & actress AND a woman in love with her soulmate & best friend. Two things that come easily to me are love and health. Of course it wasn't always that way. 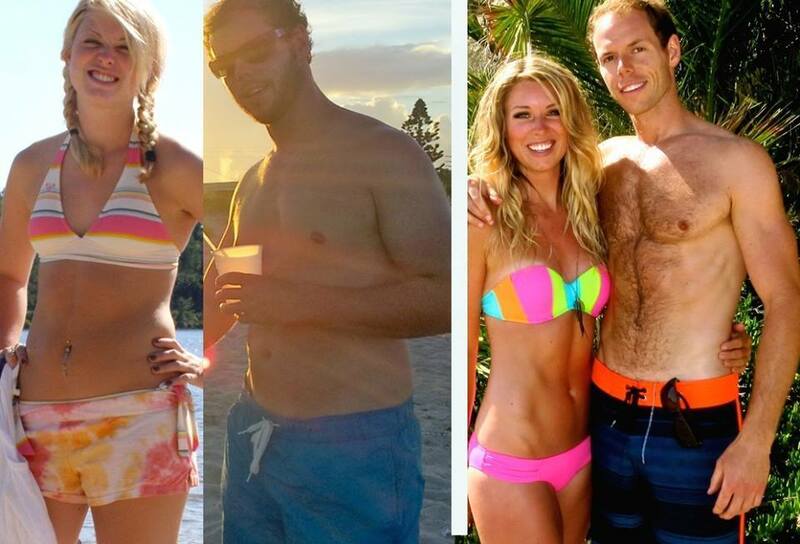 I'm sure you've seen the before and after picture of my fiancee Josh & I where we are 40 pounds overweight (I'll put it below). What you may not have noticed in that picture is that in the before photo we are separate, two pictures from different times and different places. In the second we are together, together in health and together in love. It seems we have a knack for the two considering the majority of our clients who come to us to take courses, do 1-1 coaching, have a live-in immersion experience, or come to a retreat enroll to lose weight and live healthier...which they leave with...but they also usually leave with something else. Most happen to fall in love after. It's because we don't just teach health. In order to be healthy you must first change your mindset and reach way back to find when you started limiting yourself. You remove the limits and suddenly realize that anything is possible. You repair your heart and prepare it for love on all levels. Love for yourself, deeper more present love for your friends and family and love for your soulmate...your best friend to find you or become attracted to you like when you first met. You make a space for love and a space for health where there wasn't one before. I also deeply believe that who you choose to learn from should be someone who's life inspires you. When people are surrounded by the love Josh and I have, they can't help but draw a love like ours to them. 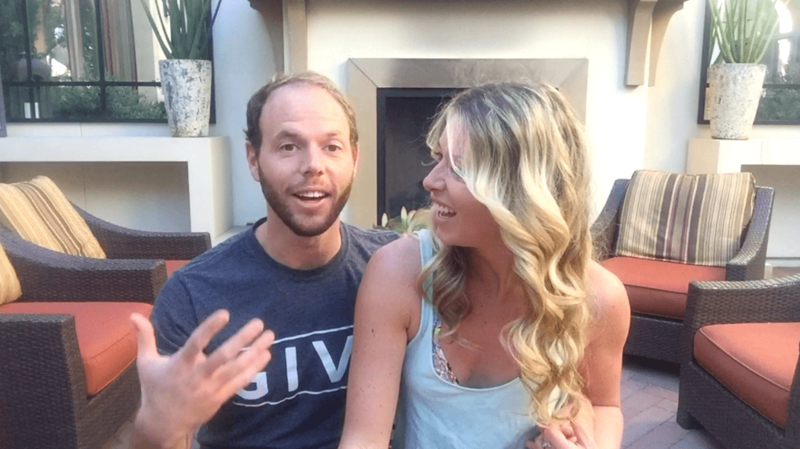 People are always coming to me looking for advice on how to find love like Josh and I. I'm really excited to give you a full strategy and process on how to do it in this course. You're going to leave feeling loved, whole, happy and healthy and will either attract the one or attract the love you've been missing in your current relationship. I can't wait for you to experience it! the top traits you want in a soulmate! Enjoy this training? Click here to like it and to be notified when I post more videos.